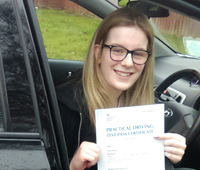 Massive thank you to Lana for helping me to pass first time! I couldn't recommend Lana enough as she is extremely patient and really helps build up your confidence each lesson, alongside being reliable and chatty! The LDC workbook consolidates everything done in the lessons and is a great way to improve your driving and understanding the theory behind driving. Lana is a fabulous instructor in every sense of the word, from the start she pushed me to strive to do my best and I actually got a lot further, quicker than I ever thought. Lana is a very approachable, easy going instructor. The best thing is definitely the feedback, straight away and very constructive for the learner. I would definitely recommend Lana to anyone looking to get through their learning period. She helped to build on my confidence every single lesson and I finally passed my test. The LDC handbook & videos helped drip feed me information going into my next lesson, looking back on it I really don't think I could have done it any other way. Thanks so much Lana! Working with Lana was a great pleasure as she listened to what was best for me and tailored the course according to my ability. She tried her best to accommodate the timing best suited to my busy schedule. I passed first time with Lana and couldn't recommend her more! She is an amazing instructor and really helped me gain confidence on the road. Lana is lovely which makes you feel a lot more comfortable while driving. Thank you for everything Lana ! Thank you so much Lana for helping me to pass my test! After failing my test previously and giving up, Lana was my second instructor and she helped me regain my confidence in the car. Lana was patient and explained my mistakes and helped me to fix them. The LDC workbook was a great learning aid for when you're at home as well. Would recommend Lana to any of my friends and family wanting to take up lessons. I passed 1st time with Lana. I am so happy I chose Lana as my driving instructor. She believed in me when I didn't believe in myself. The LDC system of learning is fab and with the workbook I had time at home to prepare for the lessons. Lana is so down to earth and patient. She talks you through all your errors and supports you to correct them, even if it takes time after time. She's a superb teacher. Thank you so much for believing in me Lana, I'll be forever grateful. 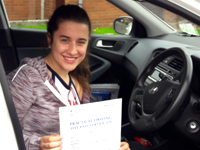 I would recommend taking driving lessons with Lana, as she is such a great instructor who helped build up my confidence in driving significantly throughout my lessons. Lana is very friendly which made me feel comfortable when driving, she also supported me well with anything I found challenging. It's great that Lana uses the LDC workbook along with the lessons to ensure a full knowledge of driving. Thank you Lana for giving me a great experience whilst learning to drive. Learning to drive couldn't be easier with Lana. She is a patient, friendly and understanding instructor and I would recomment her to anyone. She improves your strengths and works with you on your weaknessess. Lana makes you feel comfortable and safe in her car. She ensures you are ready and confident for your test and keeps you calm before and during the test. The LDC workbook breaks down the learning into manageable lessons with easy to follow illustrations and the quizzes ensure you understand the lessons content. The LDC workbook works hand in hand with Lana's teaching style. 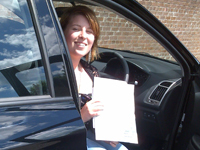 If you are considering driving lessons Lana exceeds all expectations. 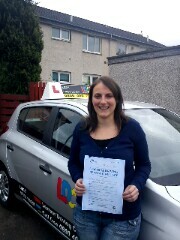 Thank you so much to Lana Wilson at LDC driving on helping me pass my test. She was so friendly, patient and really encouraging throughout all of my lessons. I couldn't recommend her enough for anyone looking for an instructor to begin lessons with. Learning to drive with Lana wa a fantastic experience. To anyone looking to pass their driving test I would highly recommend Lana. She is a very kind and patient person which allowed me as a learner to stay relaxed as she hedlped me build my confidence in driving. If I needed more help with anything Lana would explain it to me but also refer me to the LDC workbook which I found very helpful. I think learners should choose Lana as she is an amazing instructor. Thanks Lana for helping me to pass! I started driving with Lana after failing my first test five years ago and not getting behind the wheel since. Lana is friendly, flexible and patient - exactly what I needed to pass my test. I can't recommend her enough Thanks again Lana ! I would recommend Lana to anyone looking for driving lessons, Lana was very convenient in regards to working around your schedule and having the flexibility to allow you to work on what you feel was needed. She also allows you to progress at the speed you set and is patient and understanding when mistakes are made. 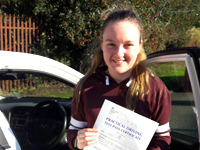 I felt confident going into my test as she gives you the reassurance needed and introduced the test routes into lessons so the test wasn't as daunting. The LDC workbook was very useful and helped me learn my reference points and also helped me to keep track of planning my lessons. Learning with Lana was a great and enjoyable experience. She was always patient with me and understanding when I made mistakes and helped to fix them immediately. She always makes sure you understand why you would do something and is always happy to answer any questions you have. 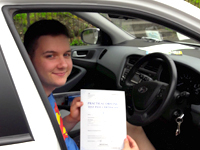 The LDC workbook helped me prepare for my lessons and easily explained different manoeuvres and basic driving skills. Lana made me feel at ease when driving and I can't thank her enough. I really enjoyed learning to drive with Lana. 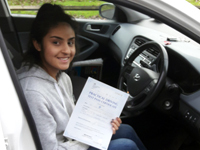 Throughout my lessons she helped me learn my manoeuvres, develop good driving practice and overall helped me build up my confidence in driving. She put me at ease, was very patient and was generally good fun. It was a great experience and I highly recommend learning with Lana. Lana was always a great instructor offering the best advice, She made learning to drive an enjoyable experience. When driving she made me feel confident and relaxed behind the wheel. This combined with the LDC workbook, which was very helpful, allowed me to pass my driving test. Lana is amazing, best driving instructor about. I would recommend her to anyone looking to start their lessons. She is so friendly, kind, patient and a really lovely lady. Always on time and very reliable. I had a great time learning with Lana, using the LDC Workbook was really helpful, being able to read over everything before lessons and after was great for me. Thanks for helping me pass Lana. 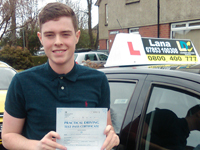 Learning to drive with Lana was a great experience, I would recommend Lana to anyone looking to pass their test. She is a very understanding and patient instructor and makes sure that every lesson is made worthwhile. The LDC workbook was also very useful, any questions I thought of to do with my last lesson I could easily find th answer in the workbook and it meant I could be improving my driving even when I wasn't actually out on the road. 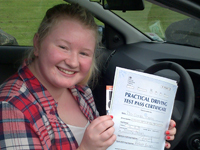 Thank you so much for being a great instructor and gettimg me to pass first time. I would recommend Lana to anyone who wants to start driving. I started my lessons with her in August and have came such a long way since then, she's very reliable and trustworthy and always gets you to push forward to succeed. Lana will keep you right by constantly encouraging you. I honestly couldn't ask for anyone better, shs's been a pleasure to be in the car with right from day one. She made me feel welcome that's why I feel learner drivers should choose Lana as their instructor. Honestly couldn't recommend Lana enough, really understanding and positive from the start, made sure I was always improving with every lesson, also as I prgressed she kept making lessons more challenging in order to improve my driving. Couldn't of passed first time any other ways so again, thanks for being an excellent instructor! I would like to thank Lana for helping me in my venture of learning to drive. She has had amazing patience and has been very supportive throughout, even in the time where I have wanted to quit and when I have found it difficult. Lana is a fantastic person and instructor and I would definitely recommend her to friends and family. 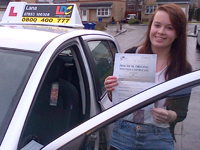 Having done my lessons with Lana was an enjoyable experience and without a doubt helped me pass first time. 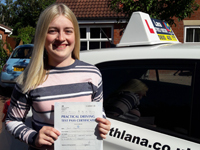 Lana was a lovely instructor with lots of patience and helped me all throughout my lessons to improve my driving and be the best driver I could be. With using the LDC workbook, this helped me visualise what I had to do for different manoeuvres as the picture in the booklet took you through the different steps fore each of them The workbook was very helpful and a quick and easy way to learn. Thank you Lana for all your support. I really enjoyed learning to drive with Lana. Lana made it a challenging but comfortable experience from the first lesson and gave me the confidence to pass. I used the LDC workbook both during and after lessons, I was able to take notes on areas I had to work on and re jog my memory when required, which really helped me a lot. Thanks Lana for everything. I had a great experience learning to drive with Lana. She was very patient and made me feel at ease straight away and helped build up my confidence over the course of my lessons. Her excellent people skills made it very easy to talk to her and feel supported. The LDC workbook used along with the lessons was also very helpful. It allowed me to go over everything we had practiced after a lesson and the diagrams within the workbook were a great visual reference. I would highly recommend Lana for everyone wanting to learn to drive. Lana is an awesome instructor. I did a week long intensive course with her and passed first time. It was hard going but Lana helped me through every stage of it. The LDC workbook you get before the start of your course explains everything very expliciitly and tells you all you need to know. The videos that correspond with the workbook help you visualise what the workbook says, which makes you more confident before you even start to drive. I genuinely could not have done it without Lana's help,patience and dedication. She gives you that extra level of care and support and makes you feel more comfortable and at ease when inside the car. Lana was recommend to me by one her previous students who also passed first time. I would happily recommend Lana to everyone! Lana is an amazing instructor with great knowledge about everything. She fixes your mistakes as soon as you make them and helped me pass first time. She really makes you feel at ease, is easy to get along with and is very patient with you. With Lana I learned a lot more and picked thing up quicker as she made it enjoyable and she goes at a good pace. I would recommend Lana to all. I'd like to give a massive thank you to Lana for getting me through my driving test! She was incredibly patient and gave me positive reassurance throughout my lessons which gave me the courage and confidence I needed to pass. Lana talked me through my mistakes so that I could fix them and I'm really grateful for all her help. I'll definitely recommend Lana to friends and family who are looking for an instructor. 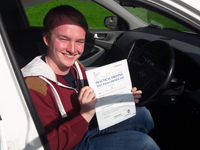 I returned to lessons after 15 months, had little confidence and was extremely nervous about driving with a new instructor. Lana's teaching skills are exceptional. I passed my test within 6 weeks, exactly when Lana said I would. I'd highly recommend Lana as a driving instructor. Thank you so much Lana, I really can't thank your enough, you're a great teacher. Lana was my 2nd instructor, when I first met her my nerves were so bad and I never thought I would be a confident driver. After a few lessons she brought confidence from 0 to 10 in such as short time. She is to patient and great at explaining every little detail that makes you a confident and safe driver. I honestly couldn't recommend her enough. 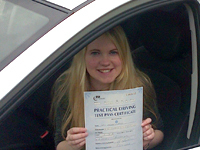 I passed my test with only 2 minors and before I would have never had the confidence to even sit my driving test. When I started my driving I was given a LDC Workbook, I felt the workbook was so useful and I learned a lot from it It really prepared me even more for my test. Thank you so much for helping me reach my goal. Brilliant instructor! I found the LDC presenter very helpful and easy to understand. Lana was very calm and patient with me also she is very funny and cheerful and that made my lessons so much fun and helped to keep me calm. I would highly recommend Lana to be your driving instructor. Thank you Lana! Lana was a great driving instructor and I would recommend her to anybody. Before Lana’s tuition I had previously had lessons with another instructor and I had given up thinking that I would ever be able to drive. 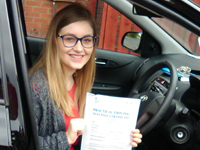 Thanks to Lana’s help and support I began to believe that I could actually drive and then I went onto pass the driving test. Lana is very friendly, very approachable and very patient. She explains everything in a calm and easy to understand manner and is happy to answer and talk through any questions and/or issues. As an anxious person, I honestly say that I would not have passed my test if it was not for Lana! Lana makes you feel at ease and believes, and has confidence, in you and your driving ability which builds your own confidence and makes learning to drive with her an enjoyable experience. 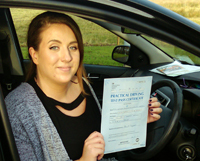 Lana is a wonderful instructor, she is very friendly, positive and patient which helped me feel at ease and to build my confidence as I learned to drive. Along with the use of the LDC workbook which I used between lessons to recap on anything i wasn't sure about, I managed to pass my test first time. I can't thank Lana enough for helping me and would recommend her to anyone. Lana was a great instructor for me, she really helped me to understand each part and she explained it again if you didn't get it. She was always really calm and cheery which made the lessons good. Using the LDC workbook helped me at the start because you already know what you are learning before you start the lesson. 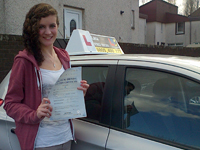 Lana is an amazing driving instructor, she was very calm and patient with me as I was learning to drive. She is great to talk to and is understanding. I made quick progress while learning to drive with Lana and I would recommend her as a driving instructor to everyone. The LDC workbook was very useful as it had a great layout that was easy to refer to for each lesson, it is packed with information and has space to write notes on anything you need to remember. Thanks Lana. I honestly can't recommend Lana highly enough as a driving instructor. I found the combination of Lana's teaching style and the LDC workbook really helpful as it helped me identify even the smallest of errors, and understand why I was making them and how to fix them. I really enjoyed my lessons and i'm very grateful to Lana for her patience and support in teaching me not only how to pass my test but to be a competent and safe driver. When I started lessons with Lana, I had already had 13 hours of learning with another instructor but felt that I have very little ability and had low confidence. From my first lesson with Lana, I felt more confident in my ability to drive due to her kind nature and positive attitude. I cannot thank Lana enough for helping me pass and gain my licence. I would highly recommend learning with Lana, she is a great instructor. Lana was helpful right from the enquiry stage and once I had spoken with her I couldn't wait to start. She explained that in 30 hours she could teach me to drive and she delivered exactly that resulting in a first time pass for me. Lana provides the encouragement you need when you are learning and is able to push you when you are reluctant. The LDC workbook was very useful to help prepare at home between lessons. Thanks for everything Lana, I'm delighted. Lana is a great instructor and a lovely person! Her patient and friendly nature helped me feel comfortable straight away and enjoy every lesson. The LDC workbook was very useful, It gave clear outlines of what each lesson was and helped me be prepared for the lesson. Would definitely recommend Lana to anyone! Thanks for everything! 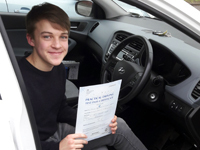 I'm so glad I chose to do my lessons with LDC, their system of learning made it so easy, the workbook was great to help me understand what I was doing when I got into the car and made me feel much more confident. I can't thank Lana enough for making me feel comfortable and supported throughout. I would highly recommend taking your lessons with Lana, I was a really nervous driver with no confidence at all, she had patience with me and was calm, she built my confidence up and I got better over time with her reassurance, I wouldn't of changed anything about her. I used the LDC workbook and it helps so much, it explains everything in detail and also has pages for you to write your own notes that you learn on lesson with Lana. Thank you very much Lana for having every confidence in me that I could do it, I'm very grateful. I really appreciate everything Lana did for me throughout the period of my lessons. Her cheery and patient nature helped me to feel settled right from the beginning, allowing me to build my confidence as we went. The LDC workbook together with Lana's organisation gave me a clear understanding of what each lesson would involve. Having successfully completed the test first time, I would recommend Lana to everyone, without hesitation. Thanks for all your help! I would highly recommend learning to drive with Lana. With a patient and friendly approach she made my lessons an enjoyable experience. The LDC workbook provided was excellent for reading up before each lesson so I was prepared for what we would be doing each time. Thank you Lana for all your help. The stage by stage lessons along with the workbook were well structured and Lana's teaching method was patient and made it easy to progress quickly. Highly recommended instructor. 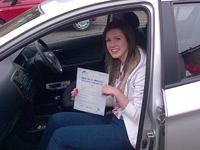 Lana was a fantastic driving instructor, always very patient and calming with a smile throughout. The LDC workbook made lessons easy to prepare for and reflect on and the lessons themselves were well thought out and very thorough. I felt confident whilst driving with Lana and would highly recommend her to other learners. 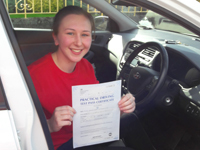 After a bad experience with a less patient driving instructor, Lana was a real blessing. She was calming, friendly and really put me at ease. The LDC workbook really helped prepare me for lessons and Lana helped me understand anything I was unsure or nervous about. Would definitely recommend Lana to anyone and appreciate all her help. Lana was a great and very cheerful instructor, nothing was any bother to her. She made everything so easy for me, providing me with a DVD and workbook to work my way through my lessons to pass 1st time. I would highly recommend anyone to go with her. Thanks again for helping me through my lessons to pass! I had lessons in the past but when I started taking lessons with Lana I felt my driving improved dramatically. Lana was really helpful when I found things difficult, her encouragement gave me confidence. I passed my test on my first attempt, I would definitely recommend Lana to my friends. 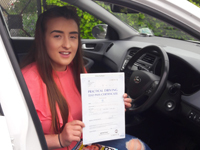 Between the step by step workbook and Lana's friendly and approachable manner passing the driving test became a very achievable and attainable goal. 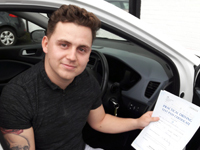 I had reached the stage where I wanted to pass my driving test, not only for personal reasons but the many job opportunities that require it. I followed the LDC workbook, reading what I would be covering in the next lesson and taking the fun quiz at the end of each section. This meant I had a theoretical knowledge of what I was supposed to do before going for each lesson. I would highly recommend both Lana who made it so easy to learn and develop your driving skills along with the workbook. 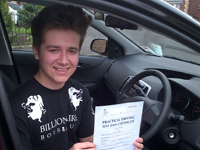 I am elated to have passed both theory and the driving test first time, 5 stars from me! Lana is a great driving instructor who was always very friendly and patient. When I made mistakes, Lana was always calm and able to reassure me so I didn't have to feel embarrassed. I was provided with a LDC workbook and DVD which was a great way to see what future lessons would entail and also to read up on anything I was unsure about. It was a really great way of learning to drive with a lovely, understanding instructor. Thanks Lana, I couldn't have done it without you! I'll gladly recommend you to anyone. Lana is a fantastic driving instructor, and I can't recommend her highly enough. Her very calm and pleasant nature made learning to drive an enjoyable experience. Lana likes to structure her lessons in accordance with the LDC workbook which I found very helpful as you could read up on prior lessons beforehand. I can't thank Lana enough, and that's now two first time passes in the Wishart household! I would recommend Lana to anyone, she is a great instructor, helpful, kind, caring and patient. The LDC workbook I received was also great, this allowed me to obtain knowledge of the various lessons and manoeuvres before each driving session and is always good to look back on as well. Thanks Lana for helping me pass my test first time. 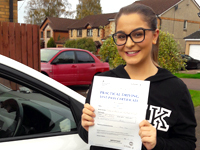 Lana is a great driving instructor very patient and helpful, I would definitely recommend Lana to anyone. 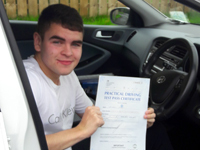 I was a shy young man at first but Lana gave me the confidence to pass my test along with the workbook and DVD so thanks to LDC and more importantly Lana for helping me pass my test - first time. Lana is a great driving instructor! I would definitely recommend her to anyone looking for a good driving instructor. Her personality and commitment helped me pass my driving test as she knew exactly what I had to work on and what my weak points were. Now I feel more confident while driving. Thanks! A few of my friends recommended Lana to me, and after just one lesson I could see why! Without fail, she would turn up on time, enthusiastic and ready to go. 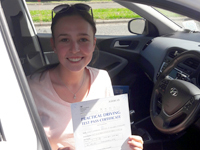 With Lana's constant reassurance, friendly attitude and ability to spot and to focus on the areas which I needed to work on, I improved as a driver and managed to pass my test first time! I couldn't have done it without Lana and her belief in me! I found the LDC workbook and DVD especially helpful as it meant I could read up on what each lesson would involve, and we wouldn't need to waste precious driving time going over it! Thanks Lana! Lana is a great driving instructor so patient and understanding, I would always recommend Lana from now on. After having 2 previous driving instructors I felt Lana's way of teaching really helped me to understand driving and bring me to test standard. Lana always believed in me even when I didn't believe in myself. I really enjoyed my lesson time with Lana, she is not only a great driving insructor but feels like a friend! Thanks again Lana, I couldn't have done it without you! Lana is a brilliant instructor. She has a constructive attitude towards the mistakes I made and I enjoyed her company as well as learning so much from her wealth of experience. Throughout the time I have been taught by Lana, she has been an outstanding example of professionialism - always on time and focused on giving me just as many lessons as I needed. Her patience, encouragement, practical advice and sense of humour put my mind at ease and gave me the confidence I needed to pass. Lana is a really lovely person and I couldn't recommend her highly enough as a driving instructor. Thanks Lana! Lana is a very understanding, patient driving instructor and I will carry on recommending her to everyone. She's great to talk to and makes you feel at ease throughout all of your lessons, making them a very positive experience. The LDC workbook and DVD guided me through each lesson and gave me a clear indication to what each lesson would contain. They were both very helpful throughout all my lessons. Lana gave me the confidence to believe I could do it and, thanks to her friendly personality and positivity, I managed to pass my test first time. Thanks again Lana! Lana is a wonderful driving instructor and I would recommend her to anyone. She was never late to any of my lessons and seemed to always have a smile on her face. She always puts you at ease and has confidence in you, even if you don't! The LDC workbook and DVD were a fantastic help and I always had a clear idea of what my next lesson would consist of. Thanks to all Lana's hard work and patience I managed to pass my test on my first attempt. I previously had about 12 lessons five years ago and had my confidence knocked so I never went back to driving. Due to my job, learning to drive became a necessity. On meeting Lana I immediately felt at ease and confident in her instruction. Lana is very patient, encouraging, realistic, fun and invested in her pupils; you know she really wants you to pass. Using the LDC workbook and DVDs gives you a focus and something to work towards which I found especially useful undertaking the semi-intensive course over 2 weeks. I passed my test first time round which I put down to Lana's teaching method, ability to instill self belief in you and I honestly believe I would not have passed without her. I have a lot to thank her for and would 100% recommend her to anyone. Lana is a great, patient driving instructor and I would highly recommend her to anyone. She's very understanding and is easy to get on with. The LDC workbook and DVD meant I always had a clear indication of what I would be doing on each lesson and they were both very helpful. Thanks to Lana I managed to pass my test. I would highly recommend Lana to anyone looking to learn to drive. She instantly makes you feel at ease as soon as you step into the car due to her calm and friendly nature. She was never late to any lesson, and due to the LDC workbook and DVD that I was provided with, i always had a clear idea of what I was going to do on each lesson, which meant no time was wasted. I was given a lot of confidnence by Lana too bacause of the encouragement she gave me and was never embarrassed to make mistakes, because I knew lana had the patience to correct them, no matter how many tries it took me. Thanks Lana. Lana is a fantastic driving instructor and I cannot recommend her highly enough. After leaving it later on in life to learn to drive, I was very apprehensive but didn't need to be. I was instantly put at ease with her friendly and patient approach to teaching. Every lesson is structured and the workbook and DVD proved invaluable to work on in between lessons. Lana came highly recommended to me and I am glad that I chose her to be my instructor. I passed my test at my first attempt and I think Lana's support and encouragement had a huge part to play in that. Lana is a great driving instructor. She is very bubbly and makes you feel comfortable while learning to drive. There was a structure to my driving lessons and I found the LDC workbook and DVD very helpful. Lana worked my driving lessons around my free periods at school and then when I had free time at university. I would highly recommend Lana for anyone who is looking to start learning to drive. Thanks Lana! I am extremely glad that Lana was my driving instructor. I was nervous about driving, and had put it off for years, but she instantly put me at ease with her friendly, bubbly nature. The lessons are well planned, with the LDC book and DVD coinciding with what is being taught, and that means there is plenty of time to prepare and think of any questions before the next lesson. Furthermore Lana's enthusiasm and patience has meant that I have become a safe, confident driver. I passed my test first time with ease, and it was all down to Lana's excellent tuition. I would highly recommend her to anyone who is considering starting their driving lessons. Due to an unfortunate accident as a passenger I was always put off driving. However when I was recommended Lana I decided to go for it. Lana, without a doubt is a fantastic instructor. Her professionalism, positivity and personality helped me to overcome my apprehension and surpass what I felt was the impossible. Lana always pushed me to learn and challenge myself at all times, making every lesson invaluable. I'm proud now to be on the road and driving my own car with confidence. I'd certainly recommend her to anyone! I couldn't have passed my test without the help of Lana! She is very patient and understanding and I would recommend her to anyone! 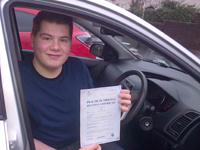 I felt very comfortable from the very start and because of that I enjoyed my lessons. The LDC workbook was extremely helpful for getting an insight into each lesson beforehand and with Lana's encouragement I manged to pass my test, thank you Lana! I undertook a week long intensive driving course with Lana, having had little driving experience before. I was very nervous but Lana instantly put me at ease. She was able to provide both praise when I was doing well and also constructive criticism when I was struggling with something. She was always positive which really helped me in myself and become confident in my driving - which is half the battle. I found the LDC workbook and DVD a great help as I could go over it as many times as I liked in my own time, then use the time in the car with Lana for gaining practical experience. I can now say that I passed with Lana, thanks to her invaluable support, knowledge and positivity. Lana's help was absolutely invaluable! She is patient, punctual and utterly professional. 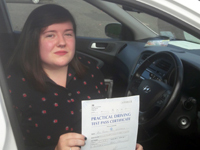 Her lessons are succinct and flow well through the driving criteria, making progress swift. She is both accommodating and considerate when planning lessons and it truly makes all the difference having an instructor who is not just teaching you but rooting for you as well. I had previous trouble with a driving instructor and after being introduced to Lana, all I can say is that I wish I went to her first! 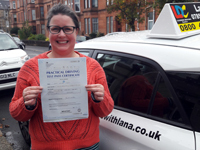 Lana is an absolutely fabulous and patient instructor who makes you feel comfortable as soon as you sit in her car as she is so friendly and easy to get along with. She knows everything you need to know about driving and will pinpoint your faults/difficulties and make sure that they soon become a thing of the past. I now hold a UK Driving licence thanks to Lana. I highly recommend Lana and LDC to everyone and anyone, so go with Lana, you will not be disappointed! I would recommend Lana and the LDC system to anyone. I was very nervous to start driving lessons but Lana was very patient and put me right at ease. The LDC workbook was excellent, each section could be studied between lessons which meant i was getting a full hours drive without having to spend time at the beginning of the lesson going over what we were going to do. Thank you Lana for helping me to pass my test first time!!! 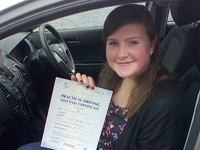 After learning with a few driving instructors since I was got my provisional, I can easily say that Lana is the best! I went with Lana after failing my test and losing all confidence in myself as a driver, but after just one lesson I felt instantly at ease and more confident. Lana is an extremely friendly, patient and knowledgeable instructor. She pin pointed exactly all the areas I needed to work on and thanks to her I am now the pound owner of a full UK licence. I can't thank Lana enough for helping me finally overcome my confidence issues and pass my test! Lana is an excellent, patient and easy going person who puts you right at ease from your first lesson right up to your test day. Each lesson is enjoyable because of that. The driving skills workbook which you get at the beginning is a great book to work from, as it gives you a basic background into the next topic area on your next lesson. I would highly recommend Lana to anyone!!! Lana is an excellent driving instructor I would recommend her to anyone. She is very friendly and put me at ease straight away. I enjoyed our lessons and knew Lana would be patient and go over any questions I had again and again. Thanks again Lana for helping me to become a safe and confident driver. I can highly recommend Lana as a competent and confident driving instructor. 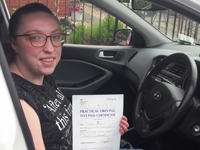 Having previously been with a driving instructor for a long period of time and failing to pass my test after several attempts, I went to Lana for a driving assesment. She was very knowledgeable, patient and I felt at total ease with her. On the driving assessment she pointed out the areas of my driving that were letting me down. 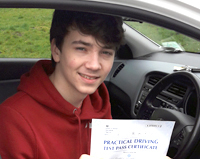 I am now happy to say that I passed my driving test on the next attempt. Working with Lana in training I have seen her develop into a confident and fun instructor. She is knowledgeable and precise and makes learning fun. Looking forward to working with you more.